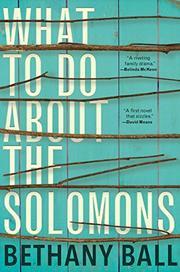 An ambitious literary debut about an Israeli family and its oddball members. When Guy Gever starts taking branches and sticks, arranging them in bizarre configurations around his home or in the midst of a field, and calling the result “art,” his wife’s family, the Solomons, is concerned. Yakov Solomon, the family patriarch, is especially concerned. Yakov has financially supported each of his children well into adulthood, and it looks like his duties still aren’t over. “When my children want money, they come to me,” he says. “I’ve paid for six weddings, five divorces, the funeral of one daughter-in-law’s father, and countless birthday celebrations. Now I must pay for Guy Gever’s madness?” Ball’s debut novel examines the lives of each of the Solomons—Guy Gever and Yakov, yes, but also Marc Solomon, Yakov’s youngest son, who moves to LA from their cloistered kibbutz, marries, has children, and is then accused of money laundering; and Marc’s sister, Shira, an aging actress who takes off for LA while her young son stays home alone; and there is Dror, another brother, and Vivienne, their mother, and also Maya, Marc’s childhood girlfriend. In short, there are a lot of characters—perhaps too many—and each chapter picks up a new point of view. Those chapters jump around in time, too, so the complexities of certain relationships aren’t made clear until the end. Ball’s prose is compulsively readable, almost addictive, and she has a wicked sense of humor. But the novel doesn’t quite add up: by the time you’ve met all the characters, the book is already ending, and nothing seems to have been resolved. Humor can’t quite save this appealing novel that ends before it’s fully begun.